We all admired the Harry Potter series, and remember each and every scene, scenario and aspect of it because of the magical world of spells, mystic creatures and the majestic Hogwarts castle. But this magical world is also filled with darkness, mainly in the form of death eaters, corrupt wizards, and dark spells. Today, we are going to talk about the top 10 deadliest curses and spells in the Harry Potter series. Read on to find out more. Avada Kedavra is the killing curse, and is at the very top of this list. There is perhaps no deadlier spell than this in the entire Potterverse. Being one of the three Unforgivable Curses, the use of this curse was banned by the ministry, and was only used by Death Eaters to commit murder. This curse has never been seen on screen in any of the Potter movies, because honestly, it would have been gory and disgusting. When someone casts this curse, a person’s insides are violently expelled, which obviously leads to death. We are quite sure that Voldemort must have used this curse on numerous occasions. When someone casts Sectumsempra, several deep and large gushes are formed all over the victim’s, leading to him or her bleeding profusely. The spell was invented by Severus Snape himself, as seen in the Half Blood Prince, and was a perfect defence against excessive bullying when Snape was in school. This is another spell not seen in any of the Potterverse movies. The Engorgio charm is usually used to increase the size of any object or individual. But the Engorgio Skullus charm increases one’s head in size, which makes it vastly disproportional with the rest of the body. It may sound funny, but it is quite deadly. Repello Inimicum is the perfect defensive spell to safeguard a place from outside interference. Once this spell is cast, it forms a sort of barrier, which disintegrates anyone who walks through it. Although this spell is extremely useful, we only see it cast only a handful number of times in the Potterverse. When someone casts Fiendfyre, a massive cursed flame spreads out and searches for live targets. This flame cannot be extinguished using conventional methods. We saw this spell being used in Deathly Hallows Part 2 in the Room of Requirement, when Goyle cast the spell and died in the flame himself while trying to run away from it. Imperio is yet another Unforgivable Curse and banned by the Ministry of Magic. This curse can be used to control the will of any victim, especially to make them kill themselves, or to force them to kill someone else. Many suspected death eaters have claimed to have been under the Imperius curse when apprehended by the Ministry on charges of murder. This spell is used to explode a target, so that he, or she, or it, bursts into flames and ceases to exist. Confringo is a wonderful offensive spell, used mainly during Deathly Hallows Parts I and II to destroy the Horcruxes. This spell is normally used to tear, rip and cut the target, which is something similar to shredding paper, but with humans involved. 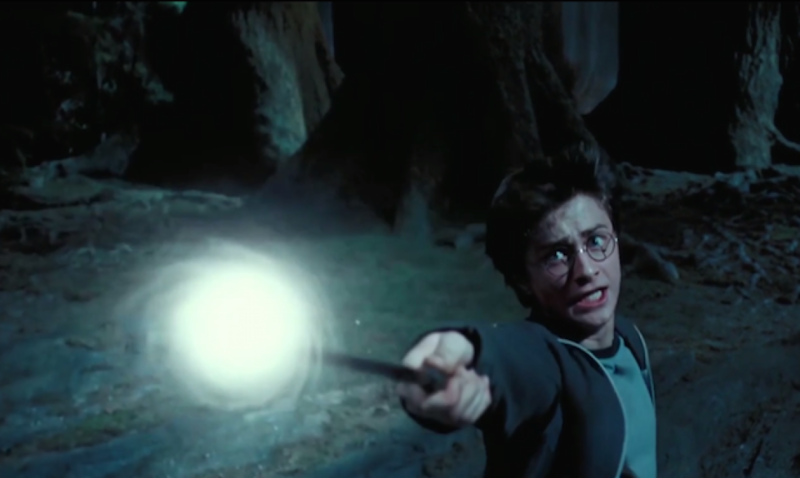 Although the Potterverse always portrayed Diffindo to be a non-violent spell, the spell can be used for more deadlier purposes. This spell is used to shoot out a snake from the tip of one’s wand as a form of passive offence. The spell was cast by Draco Malfoy during the duelling scenario in Chamber of Secrets.